What if you run a global business with hundreds of millions or even billions users? Faced with them producing a million updates per second in a world wide distributed database. Or ten million per second. Or more. With changing content that must be visible to others in real time. Do you buy or lease tons of hardware, rack space, air conditioning, energy, cabling, security staff, administrative staff? What if you run a particle accelerator or a wind tunnel generating vast amounts of experimental data within milli seconds for every single shot or try? The same questions apply and at the end of the day it all boils down to operating costs. Even if you definitely can afford more hardware and have scalable database software the scaled environment as a whole becomes a problem. With ever more nodes the setup rapidly approaches a point where pure quantity turns into deteriorating quality and decreasing maintainability. DVTDS is engineered for these challenges with no compromise. Through the entire development process we always asked if this or that could be made faster or need less memory or both. This is not just doing an engineer's job, this is something in the middle of dedication and obsession. We are out to create the most powerful directory server in the world and our benchmarks prove that we are way down the road to achieving it. Cluster performance: A database with more than four billion subscribers, scoring more then twenty two million random transactional writes per second in a cluster of just sixteen virtual machines in the Amazon cloud. Even more important: The database scaled in linear fashion without any signs of performance degradation at the high end. It also turned out that DVTDS beats leading NoSQL products when configured with their simple key value data models. Global replication performance: A database with more than six hundred million subscribers, replicated over three continents, at either site being heavily attacked from multiple clients and delivering more than one million random updates per second. Fully synchronized in real time across the Atlantic Ocean. 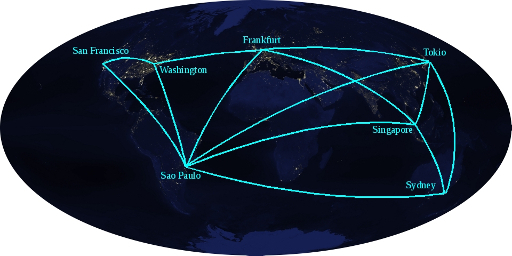 Global replication error handling: A world wide replicated database in Frankfurt, Washington, Sao Paulo, San Francisco, Tokio, Singapore and Sydney enforcing full consistency in real time despite all clients at either site producing as many distributed conflicts as possible. Doing so at a rate of more than hundred thousand updates per second on just a single virtual CPU at either site. Single node LDAP performance: Our 2014 benchmark which broke Oracle's LDAP world record. When they launched their T5-2 server in 2013 they achieved it running the Oracle Internet Directory (OID) LDAP server product on such a machine. DVTDS needed just a desktop PC to leave OID's read performance behind and reached more than fourty times it's write throughput. Doing so at just 3% of the hardware price. For the interested reader we provide here the full documentation about our benchmarks.